Aluminum Barrier Free Shower Water Dam with Flexible Vinyl Insert, designed for grouted tiled surfaces. The Barrier Free Shower Water Dam is designed to allow wheelchairs and rolling shower chairs easy access to the shower area. 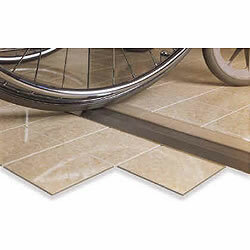 The durable soft vinyl dam is flexible for wheelchairs to roll over easily and then return to an upright position. The Barrier Free Water Dam is a great solution for grouted tiled surfaces. The base of the Water Dam is constructed of solid Aluminum with a chrome finish for long lasting durability in both Residential and Commercial applications. The Barrier Free Water Dam can be used with a shower curtain to keep the water in the bathing area and the rest of your bathroom safe and dry. If necessary, the vinyl water dam can be replaced by sliding the dam along its channel (see below). Placing two aluminum bases together and sealing the joint with high quality silicone bathroom caulk can easily accommodate oversized showers. The flexible vinyl insert can be ordered in any custom length to ensure continuous water control across the length of the combined aluminum units. Cut track 1/32" less than measurements. Cut vinyl water dam to fit length of track + 1/8". Apply a high quality silicone bathroom caulk to the bottom of the track and press into position For additional strength, anchors may be used. If floor is uneven, securing track with anchors is recommended.